I have decided to slightly alter the format of our posts and from now on the Winners and Top 5 will appear in a separate post which I shall, hopefully, post before the next challenge is posted. So please scroll down to the post below if you want to see who won our 'No Floral Embellishment' challenge. Our challenge this time is hosted by Jack and she would like to see beads used. 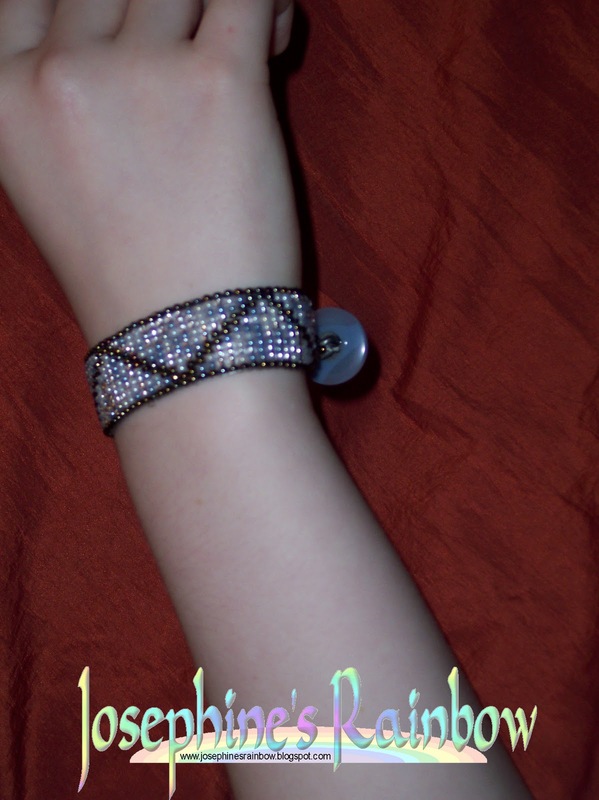 You can make a project using just beads or use them as embellishments on something you make. The important thing is that beads are there for all to see. I had so many ideas for this challenge but eventually decided to show a piece of jewellery I made as a Christmas present. I used 3 sizes of grey pearl beads, sparkly rondelles and a beautiful leaf toggle that I offset to show it off. 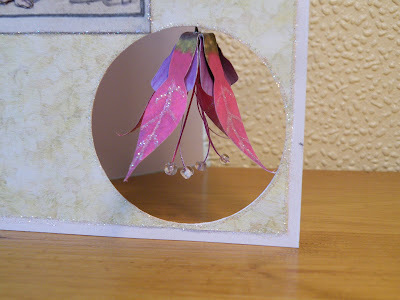 I had to think long and hard about this challenge, I was looking for inspiration when I saw the paper Fuchsia flowers I had made ages ago. I got out some beads and added them to the ends of the stamens. 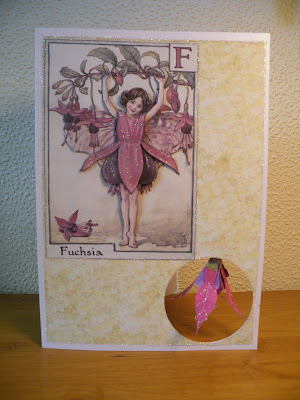 I cut the circle from the base card using a die, I printed the Fuchsia fairy off four times and made my own decoupage, printed a background paper and added lots of Glamour Dust for some fairy sparkle. I was really pleased with how the card turned out as it's different to anything I've done before. 'Use Beads,' said the challenge. So, I used lots of them, and a little bit of beading thread and a button. My daughter wanted a bracelet to go with a new dress, so we chose some beads, and I got my beading loom out and set to work. The beads are all by Gutterman, and the button is 'recycled'! Use beads is the challenge and; although I love using them I hardly ever do, so this was a lovely excuse to get out the micro beads that I've had forever. I wanted to use the pink and blue mix so raided my stash for some coordinating papers and ribbons. After matting the papers onto card, I punched three hearts out of a double sided adhesive sheet, peeled off the first paper layer and stuck them on the centre panel. Then after peeling off the second paper layer I sprinkled them liberally with the micro beads. (It's a good idea to use a tidy tray for this as the beads are so tiny they go absolutely everywhere!) 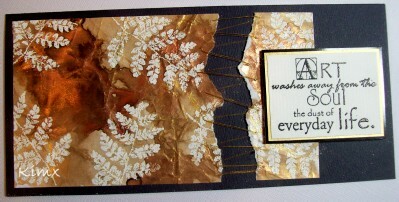 I stuck the panel to the card, added the ribbons, pearls and a sentiment to finish. I've never been keen on beading, as generally speaking I find it too fiddly. So I decided to stick to a card as my project! I've been in a "clean and simple" frame of mind recently, and I decided to make my card comparatively plain and unfussy. 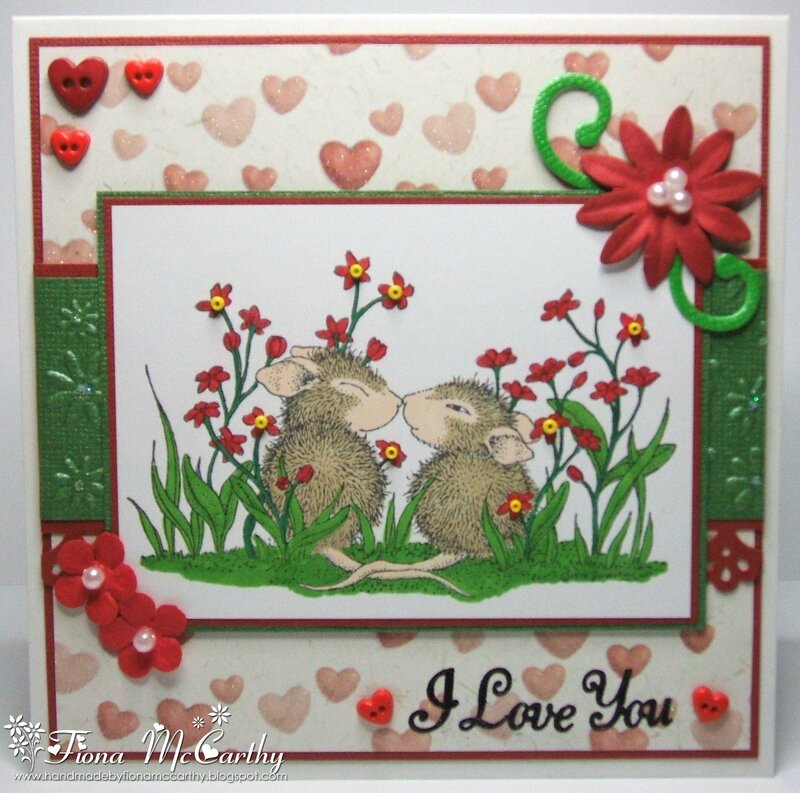 This one uses a textured card base and a limited number of embellishments and no backing paper. I thought the stamped butterfly was crying out for beads to be used in the rings as decoration and I was really pleased with the way it turned out. 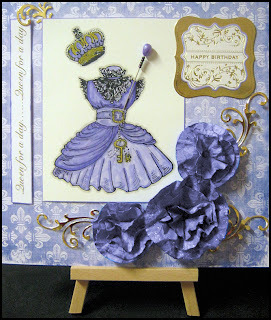 I was very excited to hear about this challenge because I have a Pretties Kit from Stampin' Up! that has rarely been used! I used a hat pin and beads from the kit with a piece of soft white ribbon at the top to accent my sentiment. The sentiment is another stamp from the Tagtastic Hostess set from Stampin' Up! I really like that this sentiment is a bunch of little dots--it looks so cool! I thought that since the sentiment was made up of dots, that I should use dots as my theme--so I went a little polka dot crazy! :) It was fun, though, and I think the card turned out nicely. I love to use beads on projects so really enjoyed this challenge. I was not sure what to do for this challenge so as that morning a new ticket die arrived it clicked. I had in my stamp collection a very classic Dress Stamp. The backing paper is one of my own designs that l will make available if wanted. The beads were added to the dress to give detail.. Tickets with Admit One were added. Use beads is this weeks challenge, for me this was an excuse to look out my tiny seed beads. I have edged the image and covered the inner flower petals with them. Not easy as these tiny beads have a life of their own. The fashion stamp is Craft Individuals and the papers from my stash. I was really struggling to come up with an idea for this challenge as I'm not good with beads. I find them too small for me to see clearly with my dodgy eyesight, but having seen the other wonderful creations by my fellow DT members was determined to have a play and this is what I came up with. Now you're probably wondering where the beads are? If you look closely at the top of the pin I've used as a sceptre you can see five tiny ones! The stamps are from the Kanban Vivienne range stamped onto Clarity cardstock and coloured in with promarkers and a Sakura gold pen. The flowers are hand made by cutting rough circles of thin card and scrunching them to within an inch of their lives before shaping and securing the layers with a small brad. The background paper was printed by me as was the 'Queen for a day' sentiment. 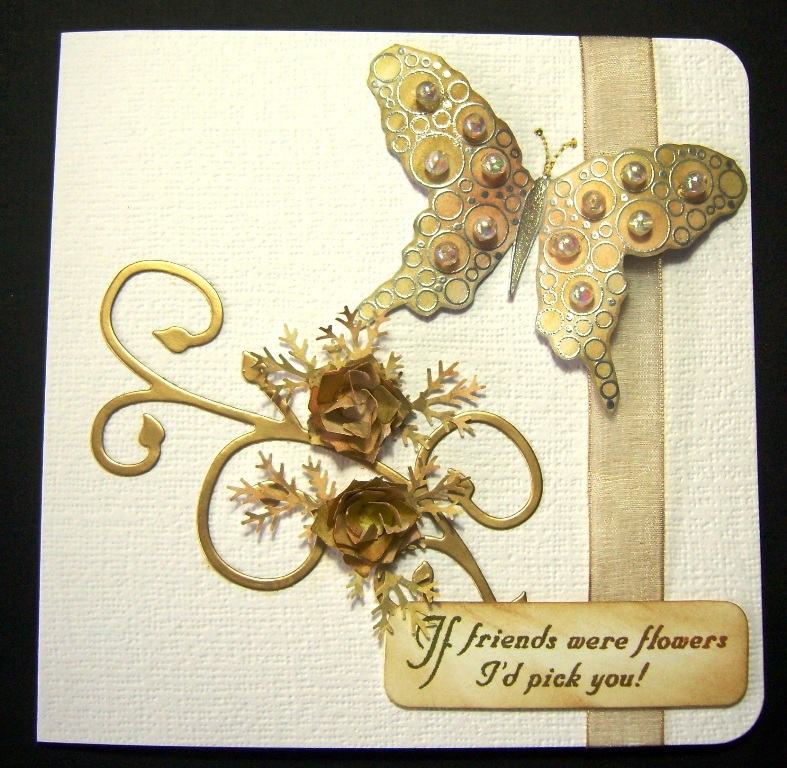 The gold flourishes are from a Marianne Design Creatables die. I found this challenge well........challenging am not really a beady person and for that reason decided to have a go, they don't call them challenges for nothing ! I cut the scale pattern with my Cameo and using my spellbinders circle die made a frame from foam. The paper inside is by Crafty Individuals from their seaside range. I covered the paper in an abundance of UTEE and as it was drying sprinkled over lots of seed pearls and some coloured beads, was trying to give the illusion of bubbles ! Made the little fish from Fimo the light air drying type. While it was still pliable I inked up A Tim Holtz embossing folder and gently pressed the image against it, a little seed pearl for the eye and there you have it ! This challenge was brilliant. I love beads and therefore I had no problems to use few of them. At the moment it is really difficult for me to use another image than Tilda *lol* I won this image (tilda with arrow) and therefor I had to use it. I colored the image with copic in soft lilac. Lovely color. The paper I used is from Creative Memories, Magnolia and Maja Design. I like to mix it. 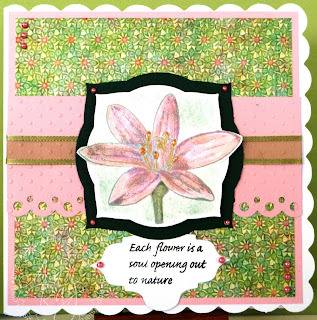 I embellished with flowers from Wild Orchid, ribbon and Alpha stickers from stash. And the beads are inside too. I'll be honest I wasn't too sure what to do for this challenge but realised I have quite a few pots of Beadazzles in my craft stash so decided to look at those and when I saw the "Electric Slide" colour set they seemed perfect for a peacock. So, off I went to search for my only peacock stamp and created this card. 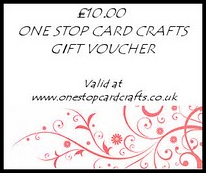 It's quite simple really, I stamped the image with versamark onto black card and used Perfect Pearls to colour it. I then created some interest on the edge of the card with my Beadazzles. I then backed the main image with green and blue mirror card. Finally, I finished the card with some black embroiderry floss to which I added some very pretty iridescent glass beads. I'm not a great one for beads, although of course I have loads of them, so this was a bit of a challenge for me. Then I remembered a card I once made for a magazine that had beads wrapped around a punched heart and decided that I would make another card along the same lines. I had a lot of trouble with this challenge this time! Not only do I only have beads for making my jewellery I had NO IDEA what to do! So after staring at my stash for days I suddenly remember seeing a wee Butterfly made using beads and a saftey pin somewhere! So a wee while later here's what I made! I used BoBunny papers, my butterfly die, a quote I found online, flowers and pins and loads of distress ink! I used paper from Bo Bunny and cardstock in Red. Colored with Distress ink pads & re-inker.Decorated with Paper Flowers,Heart Pin with mini Beads and on the Ribbon Bow is a chain with a Heart Bead.The fastener Ribbon has each two Beads in Red.Inside Box with chocolate . I love adding beads to images and backgrounds, here I've used clear crystal seed beads added to my flower's centre. Then I've scored a diagonal grid onto the pink background and added a bead at its junction, stuck down with Glossy Accents. The image is a Fred She Said digi, layered onto a couple of die cuts, the DP is Basic Grey Out of Print and the sentiment is Stampin' Up. I know, I know.... she's back with her Pink Petticoat again and no Their not paying my wages!!! Both the Image and the papers are Pink Petticoat, I find them so sweet to work with. I've added some beads to the pins to "Jazz" then up a bit and one for the center of the flowers. I used a Mo Manning image which I coloured with flexmarkers. The paper is from Basic Grey and the little birthday sentiment embossed paper (made with a folder) has been cut along the edge with my newest Marianne die. The floral arrangement contains my beads, in the form of a hatpin with extra beads and two other pins, one shaped like a leaf. Because I felt that our lovely winners and Top 5 were being lost in the long post of the new challenge, from now on I shall be doing a separate post for our winners, hopefully, before the new challenge goes live, so when you enter in future please look for a separate post either on the Sunday or earlier on the Monday. Before I get down to business, I have to say that sadly we were unable to judge a few of your entries as you did not adhere to our rules. I must emphasise again, that we only accept entries for the Top 5 and winners if you enter NO MORE THAN 15 challenges, so that’s 14 plus our own challenge. If you could both contact me by emailing me at CCMChallenges@gmail.com, I will sort your prizes out for you. 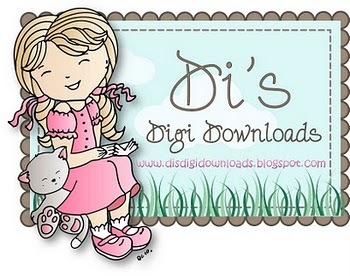 Congratulations to all our lovely Winners and Top 5, please feel free to display our badge on your blog. Good morning and Happy New Year everyone. We are thrilled to be back and raring to go, as indeed we hope you are. 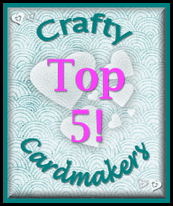 Congratulations ladies, please feel free to display our Top5/Winner badge,whichever is appropriate and if the winner could contact me via the address in the righthand side bar I will sort out her prize. 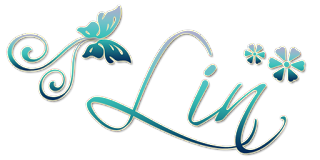 It's all change at Crafty Cardmakers and we have some fabulous new sponsors for this year, you can read all about them on our new Sponsor page and you should be able to find links to them also in our right hand sidebar. Please read the requirements below carefully, as sadly we had to discount a few of you in our last challenge for NOT following the theme correctly. You can use flower Backing Paper, flowers in your image or even a flower as an image, but NO floral embellishments, so no flowers, flower shaped buttons, or anything else resembling a flower that you have added to the finished card. For my card I have used Skateboard Tilda which I stamped and then masked off and overstamped with the Butterfly Background stamp.I have coloured the image with ProMarkers.All of the papers that I have used are from Papermania.I have made the little butterflys by sticking peel offs onto vellum and cutting them out,and coloured them with Sakura pens. My sentiment is a digi from Crafty Sentiment Designs.The mini buttons are from Papermania and then finally added some stickles to the buttons and image. I was lucky enough to win some images from Digi Doodles recently, and I fell in love with some of their landscape images. This one is probably my favourite, and it seemed ideal as a card I could use for anyone - particularly for those pesky men. The image is mainly watercoloured with Aquamarkers, but I also used Twinkling H2Os for the water to give it a nice shimmer. To finish, I've used some paper from Paper Cellar which I edged with Distress Ink, and some die cut swirls. This little bear is from Lilli of the Valley, I stamped him on watercolour card and used my watercolour pencils to colour him, I was surprised at the difference the card made in the result you get with the pencils. I inked the card as it was white and too stark, the corners are from my collection of dies. I mounted the little bear onto some more holographic card just to tie it all together. For this challenge I started off by choosing a Docrafts "Tulip" die cut topper. I matched up some pretty gingham & dotty papers from my stash & then matted them onto a pink card base. I wanted to add a bit of lace but not white & came across some in pink, that I'd recently bought, which was perfect. A couple of heart shaped buttons tied with raffia were added for minimal embellishments. 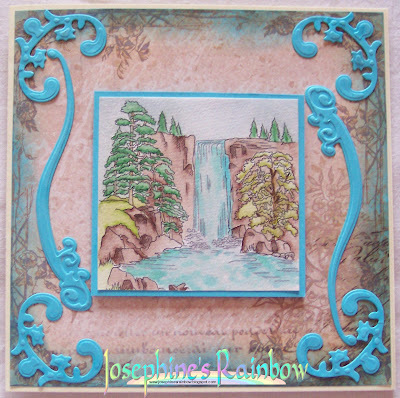 I thought it would be nice to make a plain card for this challenge, and in fact, have very little embellishment on it at all. 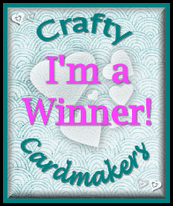 The card was made using a plain white base card, and my main topper was a digi stamp called "Running Away" from one of our sponsors today - the Digi Doodle Shop. I coloured the image using promarkers and stamped a suitable sentiment at the bottom in versamark ink and embossed with silver detail powder. 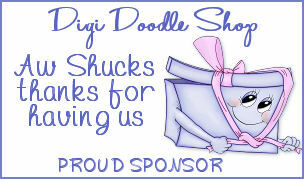 For this challenge I chose a fabulous digi stamp called "Let's Do Lunch" from one of our new sponsors Digi Doodle Shop. I paper pieced the piggies and their trough and the rest of the image was coloured in using Promarkers. The corner of the card was stamped with a La Blanche foam stamp and embossed in bright gold embossing powder and I popped a few lime green gems to give a little extra highlight. The sentiment was attached with a plaited length of plain old garden twine which I made into a tassel. 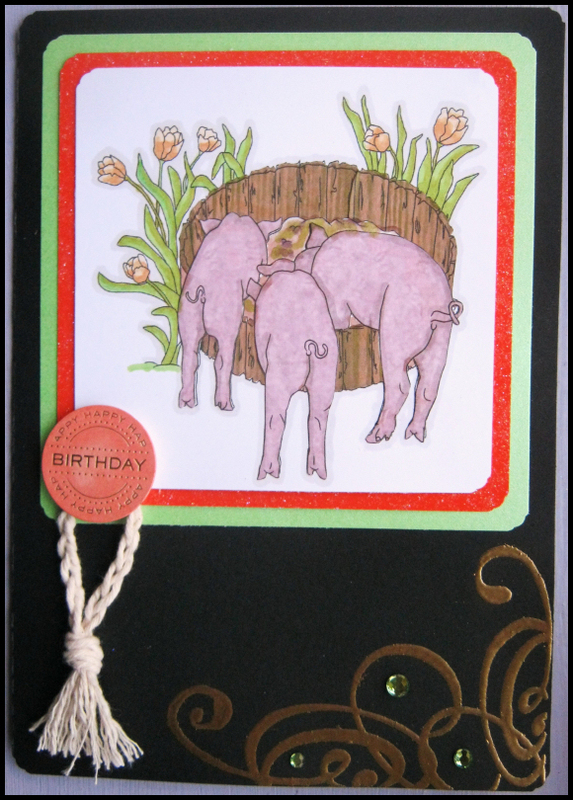 The inside of the card reads "It's your birthday, so you're allowed to pig out!" It was made with a dieting friend in mind, I sure hope she's not offended! 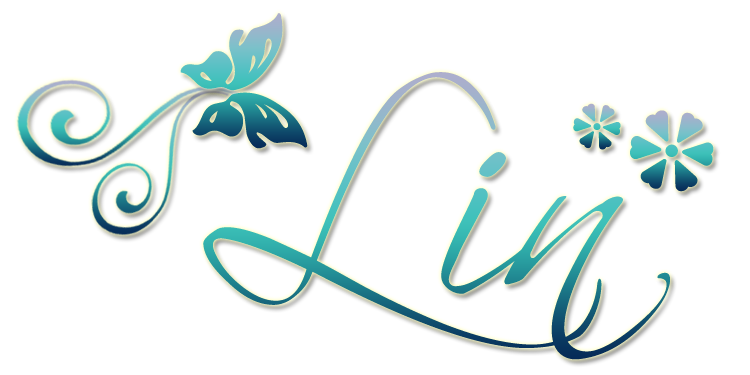 Mynnette I've used an image from Stampin' Up! 's Tagtastic Hostess set as my main sentiment and image. I stamped it in black and white, then punched it out with a large oval punch. I highlighted it with two more ovals on top and bottom. I used some green ribbon to highlight the green accents of the sentiment. I dry embossed a purple strip and glued it to a white strip then added it to my patterned card front. I'm very pleased with how the colors worked out--I think I'll probably use them again! I went for colours I don't use very much for this card. 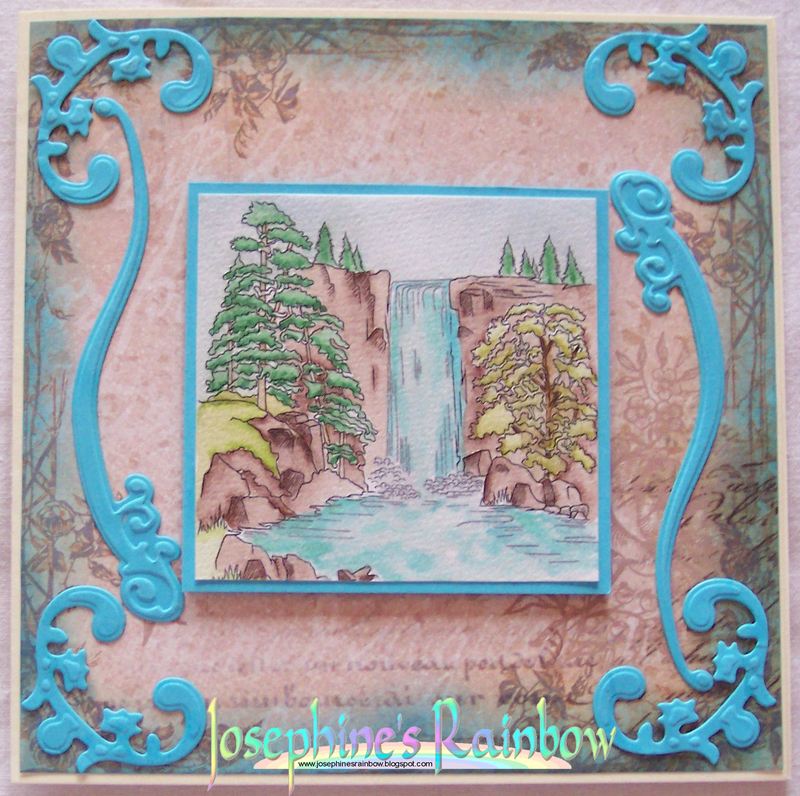 I used orange, brown and green card and the lovely image is Faith in Nature from Stampin Up, coloured in with pencils. 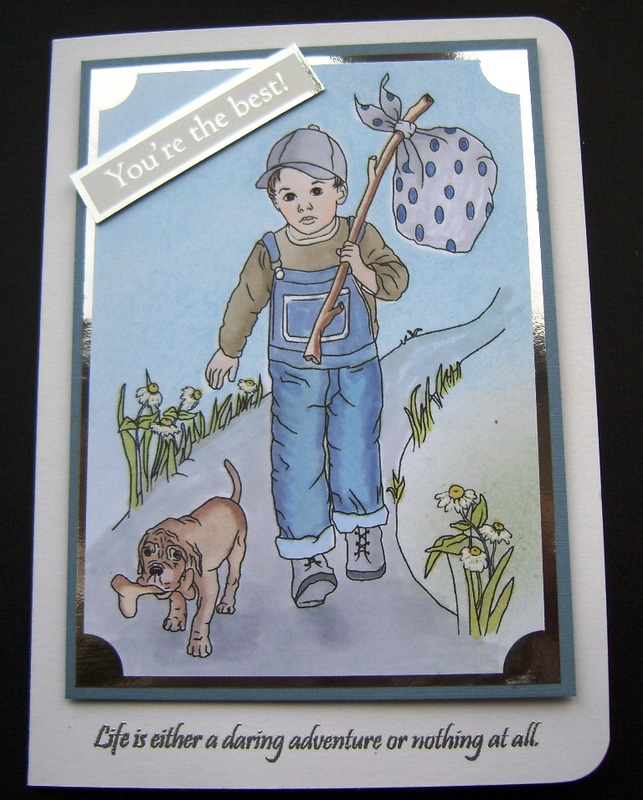 I have used an old favourite stamp for this card by Art Journey, I just love this little lad who seems to be growing in the plantpot. It was hard not to add a flower embellishment so I finished off with a plain knot tie. I have used a paper bag and decorated with design paper from Papermania "Honey & Hugs " I chose a Digi stamp image from Digi Doodle Shop " Sleeping Infant " colored with Distress Ink Pads and Watercolor Pencil. Embellishments Buttons , Charm , mini Rhinestone and Ribbon . 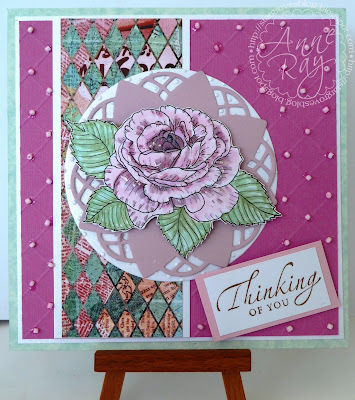 For this challenge I have teamed my favourite Pink Petticoat papers with a Kenny K Digital stamp coloured with Copics. I've added a little lace and a few gems and a fabulous heart charm. I have embossed and paper pieced the pears with the co- ordinating paper from the Pyrus paper pad, added some red and green stickles , distressed and inked the edges of the papers and mounted it onto some cream linen card. 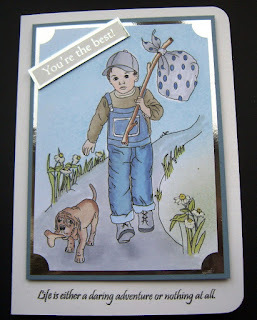 The "No Floral Embellishment" challenge seemed to me a perfect opportunity to make a male card. I've kept it quite simple using a "The Greeting Farm" stamp and colouring it with promarkers and coloured pencils. I thought the image looked quite sporty and followed that theme with the border and used brads for an all-star look. I wanted to make a male card with a flowery content. The paper started life as a wall paper sample. This was then embossed, distressed and inked. The Glitter ribbon was toned down by using Butchers Twine. 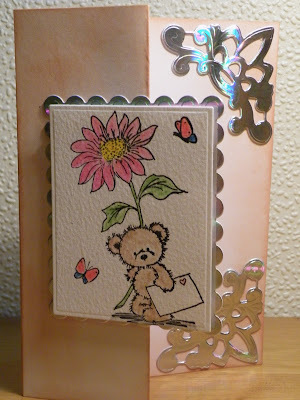 The edge of the card is soft but it did follow the flower theme. Small brads were re-coloured with a pen to fit it all in one colour scheme. 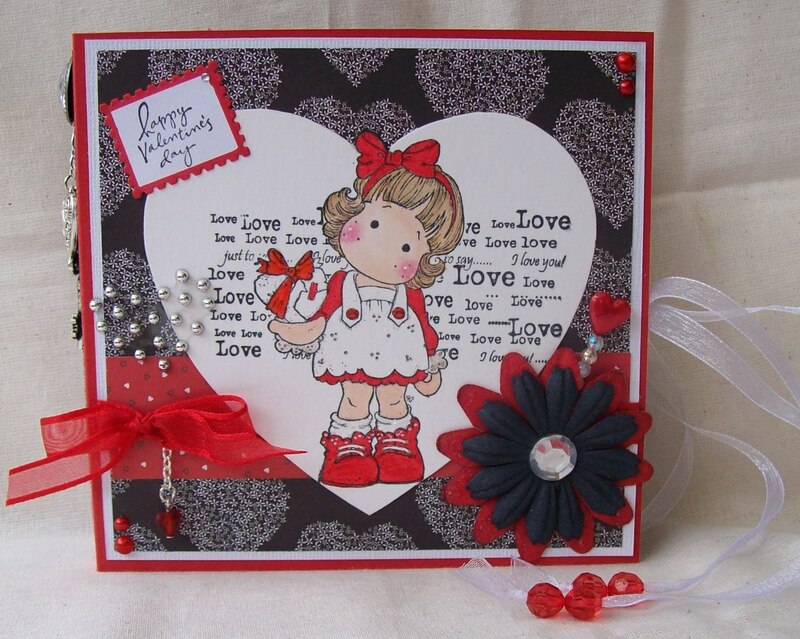 For my *No floral embellishments* inspiration I have used Abigail Apple by Kraftin Kimmie stamps coloured using copics, teamed with Memory Box papers and a lovely deep rich red satin ribbon tied in a double bow. For my card I used the absolutely cute and lovely digi stamp from Digi Doodle Shop " Sleeping Infant ". The little baby looks like my son *lol* I colored the image with my Copics. 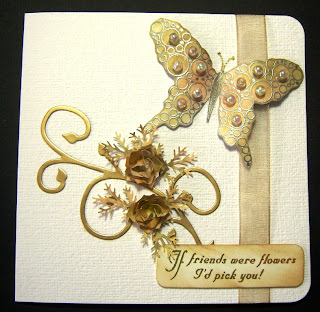 I made a very flowery card for the "no floral embellishments" challenge:). The image is from a gorgeous new set called Engraved Flowers by Stamp Addicts and is coloured with Copics and Glossy Accents. 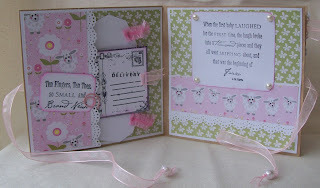 The paper is Basic Grey and I've added a ribbon, a dotty embossed border and lots of little pink pearls. 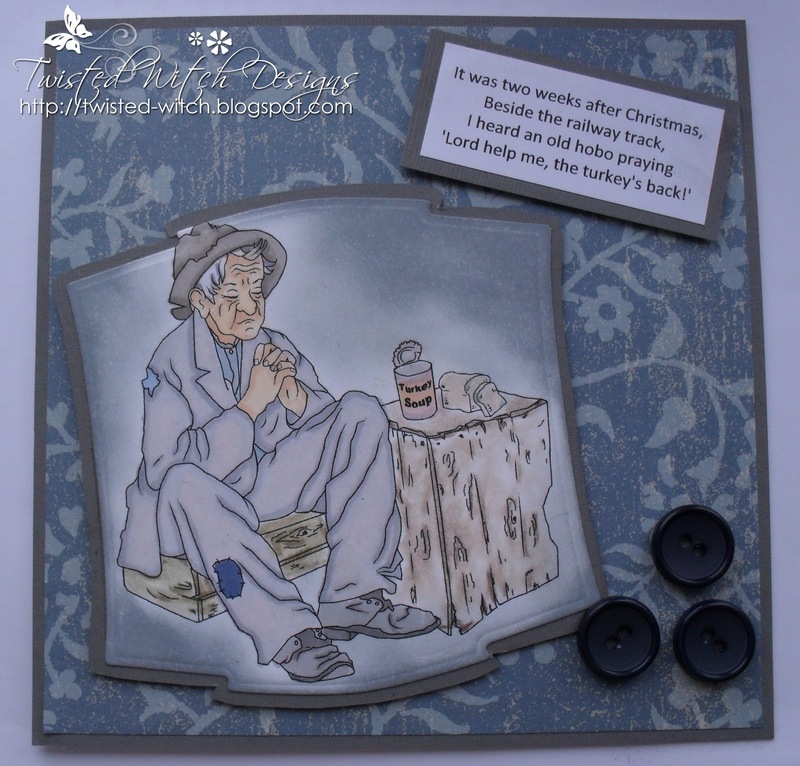 For my card I have used a Hero Arts leaf stamped and embossed with white embossing powder and the truly stunning Starburst Stains from The Stamp Man to create my own background paper. I tore the panel in half and then 'stitched' it back together using metallic thread. Not a flower in sight. I was stumped at first with the Challenge! Looking through all my projects a "theme" of using flowers seems to be occurring! So I decided why not go with a Male card! A challenge in its self for me!! So after finding my fun wee LOTV image and bright cheery Basic Grey Papers this we card just happened! And not even needing to add any flowers though there are some gems lol! As a team we were fortunate enough to be able to choose some images from Digi Doodle Shop and as soon as I saw this one my mind saw something amusing. I have imagined that Hobos, or tramps as we Brits call them, would be just as fed up with turkey as the rest of us are after Christmas. I have coloured him with promarkers and prismas and the paper is from K & Co.